Heat, feet, up's and weight. These were 4 factors that would influence this hike. 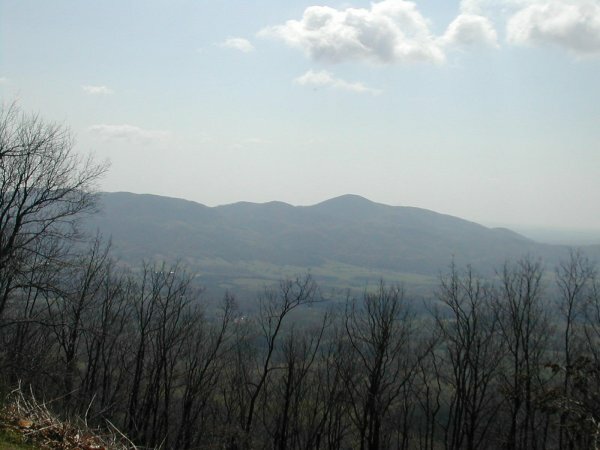 It was a 5 day 55 mile backpacking trip on the Appalachian Trail between Troutville and the James River in Virginia and took place between Sunday, April 14th and Thursday, April 18th, 2002. 4/14/2002- Tom Stevenson and I met at the Hardees in Buena Vista. We then went to the James River Foote Bridge where we were joined by Bill Isham and his wife Chris. We then drove south to the Troutville AT trailhead parking on US11 and started the hike at around 12:30PM. Total crew of 4 for this trip. upstate NY. They were leisurely hiking the trail and appeared to be having a good time. We walked with them north down Fulhardt Knob looking for a spring for water. But we could not find it. We knew then that water would be a commodity from this point on. The temperatures were in the high eighties that day so we were sweating profusely and going through alot of water. We did an up and then a slight down to Salt Pond RD. We then did a big down and crossed various creeks going up and then down between them. Then, after crossing Wilson Creek the sign said "Shelter- .7 MI". Someone penciled in "Uphill" underneath it. It was a tough last .7 miles to the shelter. I was tired and my feet were hurting at the end of that day. I didn't even bother to go down to Wilson Creek to get water. I had silver dollar sized blisters on the back of my feet due to wearing boots purchased last December that were evidently not broken in yet. 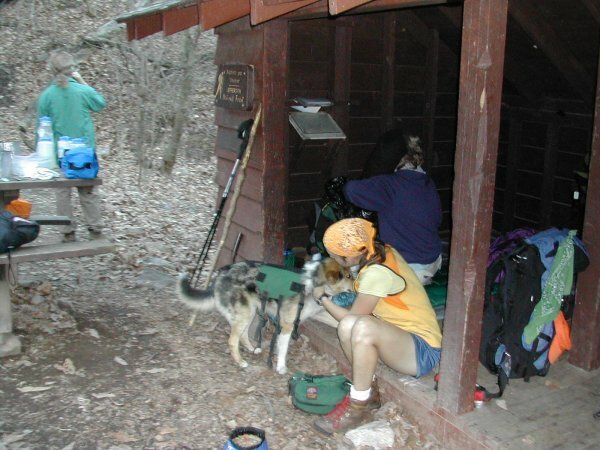 4/15/02- We modified the goal today to be an easy 7.3 miles and Bobletts Gap Shelter. I bandaged my blisters and we set off. When we got to Black Horse Gap my bandages had shifted and my feet were aching like you know what. We started hiking the trail parallel to the parkway. The temps were in the mid 90's. I was in pain so much that at one point I just sat down on the trail and called my wife on the cell to see if she was available to come down and pick me up. 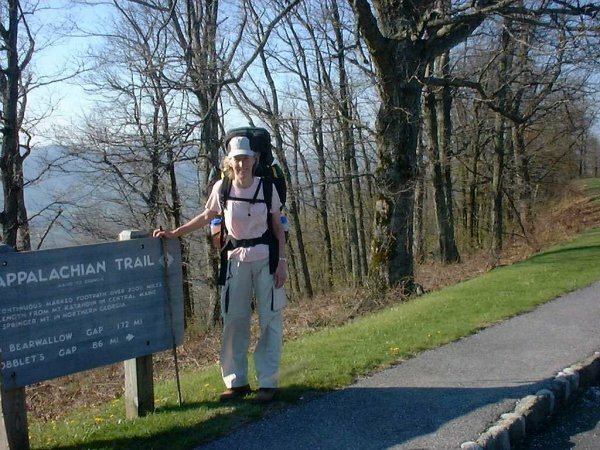 While talking to her I saw a thru-hiker walking the parkway about 50 feet away from me. I jokingly said "Hey, the trail is over here!" He said that he had run out of water and was walking the parkway to expend less energy and was going to try and bum some water off of motorists on the BRP. I thought to myself "I'll try walking the parkway!" So I did. It was a very pleasant 4 miles. 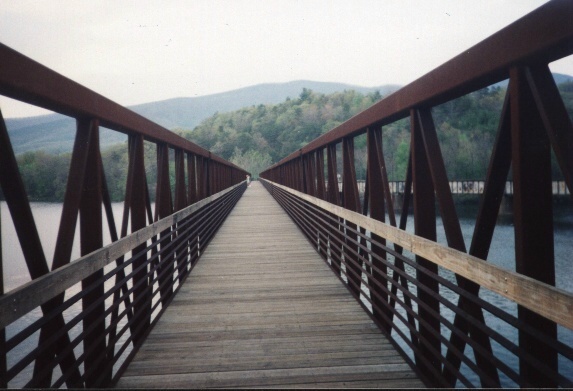 I had good footing for my blisters, no more than a 45 degree angle up or down and guard rails that were perfect to take a break and sit on. I left the trail at a bridge overpass and made it to Bobletts Gap Shelter in the middle of the pack instead of my usual last place. Hey, I cheated but at least I made it. Tom S was holding up well. Bill I was feeling the effects of the heat and was thinking of bailing. We were not a happy lot. But it was nice to get to camp at 3PM in the afternoon and relax. We were joined at dark by thru-hiker "Willow" and her dog "Gravy Train". 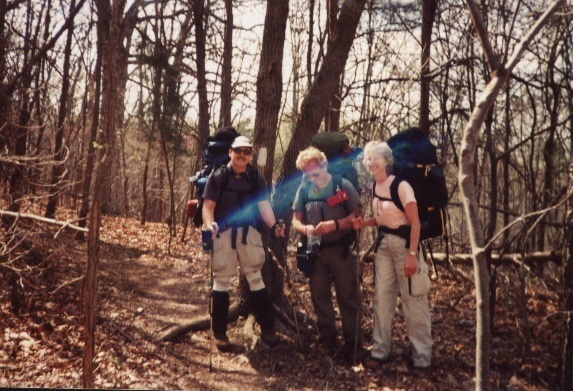 4/16/02- We knew that we had to make the miles the next 3 days if we wanted to get off of the trail by 4/18. So the goal today was 13.4 miles and Bryant Ridge Shelter. I had to make a decision: bail out or tough it out. So, taking a tip from a thru hiker that I knew I proceeded to wrap my feet in duct tape (over the bandages, of course) to keep the pain from coming through. It worked well. Though I was still in some pain the bandage/duct combination made it more bearable to walk. So we did. 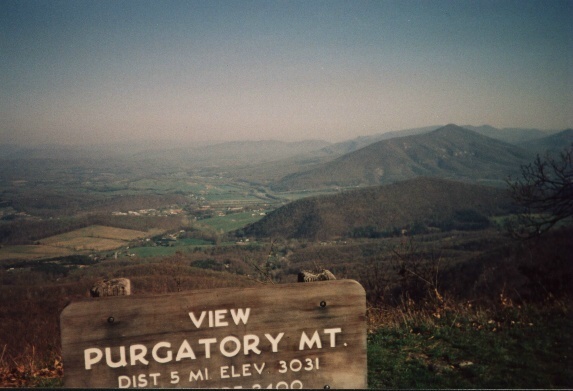 I took the parkway to VA43. The rest took the trail and we met there. We then had a long tough up and then had to ridge along dry and very hot Cove Mountain. Due to the drought everything on top of this mountain appeared to be dead. We then descended Cove Mountain and got to Jennings Creek, a swimming hole for the locals. The water there was nice and cold during this 91 degree day. We splashed it all over us to cool the sun burn that we had received on top of Cove Mountain. It was 5 miles out to I81 and a motel at this point. We again discussed bailing but agreed to push on. We had a long up and then a down to the shelter. The rest made it before dark. I didn't. I ended up camping about a quarter mile before the Bryant Ridge Shelter that night. 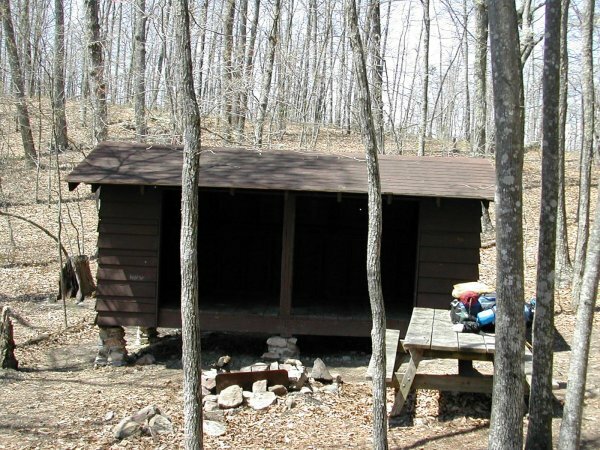 4/17/02- I got up early the next morning and joined the others at the Bryant Ridge Shelter. Beautiful shelter, but the roof leaks there. Oh, well. They had 2 thru-hikers with them last night. The goal today was 10.2 miles. Not bad but we were facing the worst up of the trip- Floyd Mountain. This was a 4 mile up that was a 2200 foot elevation change. It was brutal. Temps again in the 90's, minimal tree canopy to protect us. Water was again in short supply. We struggled up this terrible mountain. About mid afternoon we made it to Cornelius Creek Shelter. We wanted to make it to the next Shelter, Thunder Hill. But we knew that if we hiked the trail legitimately, we would not make it in time and would throw the hike into a 6th day. We didn't want to do this so we decided to again hike the parkway for 3.5 miles versus the trail's 5 miles and an 1800 foot elevation change. So we're not purists. Sue us! It showered slightly during this road walk, which was a nice respite from the harsh sun. We got to Thunder Hill at around 6PM and had time to relax, prepare dinner and go to bed. About 9PM a gentleman from Washington, DC came trudging in from the north. 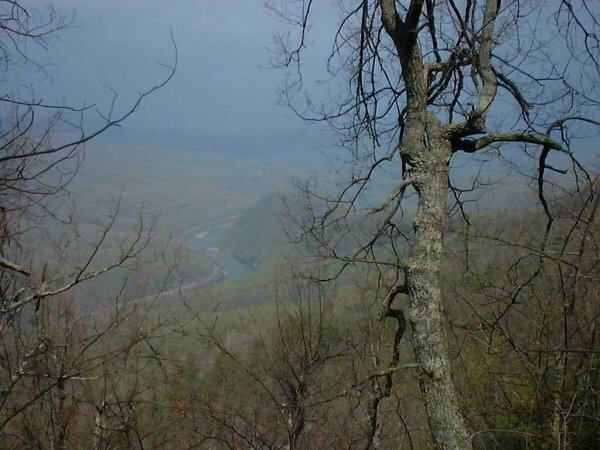 He had hiked up from the James River that morning and was just getting in. He was in good shape and good spirits considering that he had just hiked 14 miles mostly uphill. We talked alot about life around DC, having all been from around the area. Branch. We had a final snack at Matts Creek Shelter at 5:30 and made it off of the trail by 7:30PM at the James River Foot Bridge. About a dozen thru-hikers passed us during this trip. Most of them started at Springer in late February or early March and had encountered mostly mild weather up until this unusual hot spell that we encountered. Heat, feet, up's and weight. If you plan to hike this section of the AT, please plan to carry 80-110 ounces of water and fill up often. The heat will make you drink alot of water. The substantial elevation changes could effect your feet so take care of them or they will make it rough for you. Also, be in shape if you plan to do this section. I wasn't and slowed down my party for it. I'm glad that we got this section out of the way. This was my last section in VA so I was relieved to have it out of the way. 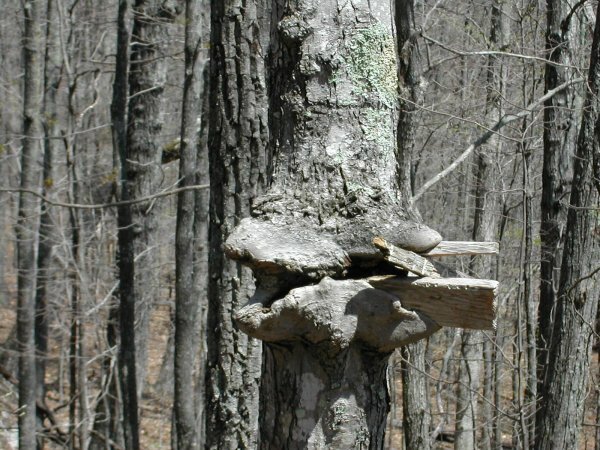 This section of the AT is a challenge and an accomplishment. It has some beautiful scenery but must be respected for the challenges that it imposes. Group picture at start of hike. Chris at overlook along BRP. View from above James River.